Bus fare is 35 baht. Bus No.551 connects Suvarnabhumi Airport to the Victory Monument via New Bangkok – Chonburi expressway to Srirat expressway for exit at Rama 9 toll gate to continue further along Asoke-Dindang Road and Rachawithi Road for the final stop at the Victory Monument. Bus No.555 connects Suvarnabhumi Airport to Rangsit via Department of Employment – PTT Don – Muang – Vibhavadi Rangsit Junction – Rangsit. Bus No.556 connects Suvarnabhumi Airport to Southern Bus Terminal via Yommarat – Democracy Monument – Thammasat University – Pata Department Store – Southern Bus Terminal. Bus No.557 connects Suvarnabhumi Airport to Wongwien Yai via Rom Klao Junction – Chalarat Hospital9 – Technology Business Administration School, Samut Prakan – Chalarat Hospital 4 – Rung Chareon Market – Suksawat Road – Ratburata Hospital – Wat Sawetchat – Wongwien Yai. Bus No.558 connects Suvarnabhumi Airport to Central Rama 2 via Central Park Hospital – Chalarat Hospital 1 – Ramkamhaeng 2 Junction – Srinakarin Junction – Bang Na – Soi Lasan – Rung Chareon Market – Suksawat Road – Lotus Bang Na – Bang Pakaeo – Bhuthabucha Junction – Bang Mod Hospital – Central Rama 2. 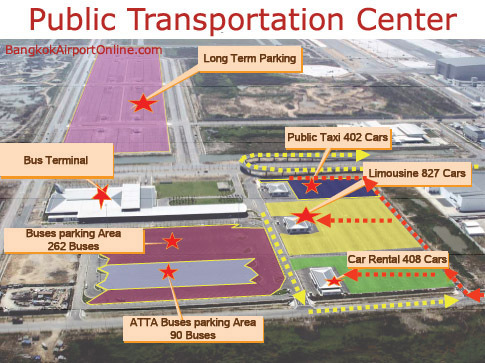 Bus No.559 connects Suvarnabhumi Airport to Future Park Rangsit via Dream World – Ek Prathum Hospital – Future Park Rangsit.